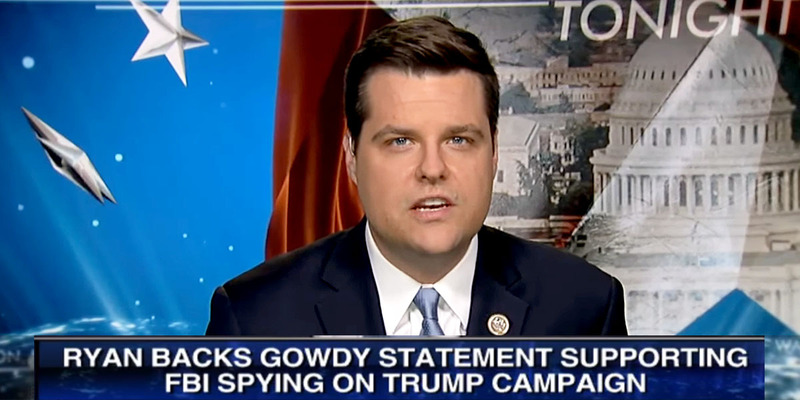 Gaetz agrees that not only has Ryan never defended he President in the absence of any evidence to support the witch hunt, he’s also failed to support the calls of numerous high profile Republicans for a second special counsel to get to the bottom of the criminal activity and corruption at DOJ and of the previous administration. This action by Gaetz likewise appears to be evidence of that frustration and a determination that it’s time to take action, to boot Ryan to the curb, where he belongs. I look forward to a call for new leadership, and a demand for Ryan to be replaced, as well as action to get it done immediately. IMO. I’d like to see Jordan take the helm and see what he accomplishes between now and Nov.
i really LIKE THIS CONGRESSMAN, he is NOT afraid to SPEAK TO THE PROBLEM, RYAN IS A RINO GLOBLISY AND TRAITOR IN MY OPINION.